For the opening ceremony, we had two musicians,Jason Kouchak on piano and Alf Wilheim Lundberg who played an eight string guitar, played some lovely tunes for us. I figured out that Alf’s interpretation of a Christmas song was “Silent Night” where as Gawain thought it was “Away in the Manger”. The ceremony was broadcast live this year and I hope many of you were able to watch it and enjoy it. The auditorium was completely full and I tried to takes some pictures but they came out blurry. There is also a push this year for online donors to contribute what they can to the charity. 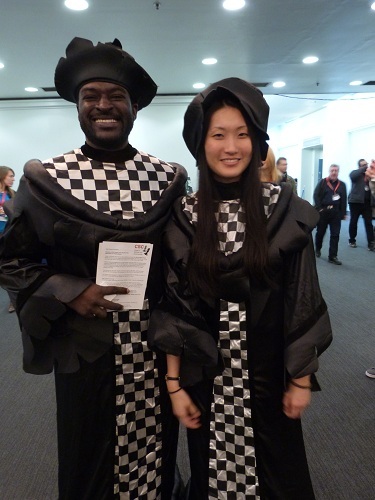 If you weren’t aware, Chess in Schools and Communities run the event and it’s objectives include improving children’s educational outcomes and fostering their social development by introducing them to the game of chess in schools and inner city communities and in general raising the profile of the game and highlighting its educational and social benefits. They are currently mainly in England and Wales but are branching out at a very fast rate which means they need more chess tutors! So if you are interested in teaching, feel free to contact them through their website. Malcolm Pein CEO of CSC as well as chief organizer of the Classic, is very passionate about the charity and so he should be! If every online viewer donated £1 we’d be able to fund the charity for a year or host the Classic again! I’m definitely keen for the Classic to continue as it’s such a fantastic tournament. 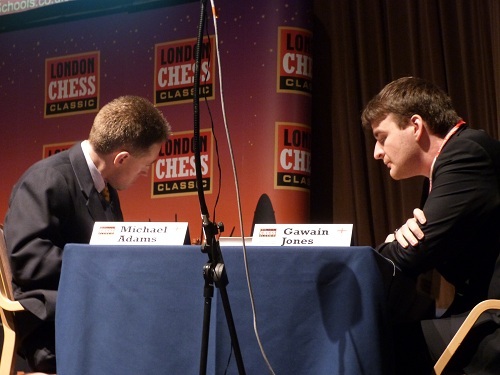 If you’re keen to do a chess holiday what better place they London except that it’s always busy and can be quite expensive but there are lots to do. We are quite spoilt for choice as a Londoner. Seeing the the top players around and commentating is a great way to spend the day. So yesterday, every game was decisive. I don’t know how common this is as I haven’t looked at the stats but I do know a lot of top games are drawn. Maybe this football scoring systems mean players are going to be more ambitious and therefore are prone to mistake. I guess it’s better this way to lose a game, win a game and draw a game (4 points) as oppose to draw 3 games (3 points). I don’t have a real opinion as I’ve never played with this system. I guess it’s quite good for spectators and it can mean that games potentially become more of a fighting spirit But what makes a good chess game? Would I rather see perfect chess or someone winning? In most sports you have times where they allow draws, in football most of the time things are drawn except for knock outs when it becomes sudden death. Maybe chess could be more like that? I think if a player isn’t trying that’s bad and that is probably when the organizer should step in and have a word with them and invite more ambitious interesting players to play in their events! Aronian-Nakamura: Just a bad opening for White. 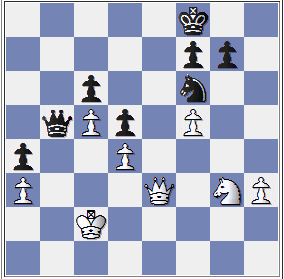 He then managed to equalize but in time trouble suddenly blundered and then had to quickly resign. 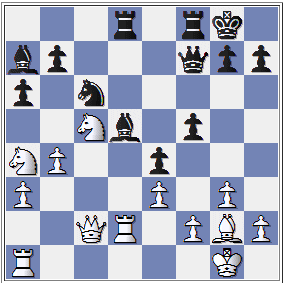 White here played 26…Rd2 and white blunders a piece as after 27. b6 Na6 28. Bb3 forking Queen and Knight. 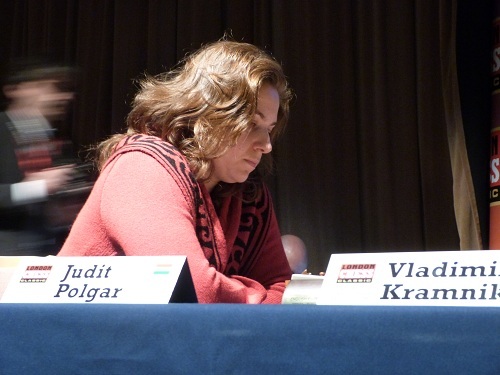 Kramnik-Polgar: Judit had a very cramped position and saced a piece for two pawns at first Kramnik thought it was awfully bad but the more he thought about the less bad it seemed. 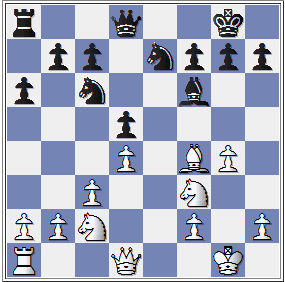 Judit then blundered and Kramnik comfortable converted. leaving Carlsen with a crappy structure going into the endgame.Luke chose not to do that but instead planned a kingside assault that didn’t quite hold together. 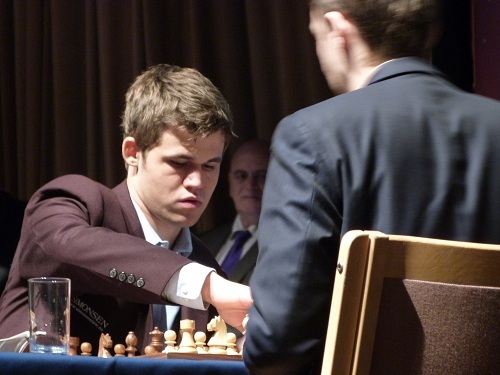 In the endgame it looked unpleasant but Carlsen as they say turned on the screws and marched his king up the board and Luke’s position collapses. Jones-Adams: This was a 91move game and the game finished around 9pm, we had dinner around 9.30pm (quite hungry at that point). Gawain’s opening went wrong though I’m not so sure where and he had an unpleasant position for the majority of the game in what Nigel Short called a “Mickey position” Mickey was able to convert.. Gawain seemed to create a fortress but in time trouble erred and things then went downhill with Mickey winning one pawn, then another and then was about to win another two and so Gawain resigned. It’s a very tough field for my hubby, but he knows that we all support him! 🙂 Today he is playing Judit Polgar known for her aggressive style, this is the first time they have met over the board and he’s wanting to give as good as he gets. By the way, a lot of the notes I give about the game I got from the commentators: Julian Hodgson, Steven Gordon, Nigel Short, Vishy Anand, Vlad Kramnik!! (so if it’s incorrect, it’s not my fault).